What Should I Do About the Latest Breach? - Ask Leo! What Should I Do About the Latest Breach? Another week, another breach. What steps should you take in the wake of the latest large-scale data breach? As I write this, there’s been a breach (referred to as the “Collection #1 breach“) that apparently contains something like three-quarters of a billion email addresses and plain-text passwords. It’s newsworthy because it’s huge and contains passwords for anyone to see. It’s also quite frustrating, for reasons I’ll outline in a moment. Naturally, the question I’m getting most is simply this: what should you and I do? The same thing we do every breach, my friend; the same thing we do every breach. It’s huge. The original report cites 773 million email addresses, and I’ve seen subsequent headlines quoting a billion and a half or more1. That may be the biggest breach to date. It has email addresses. This is not new, and in fact is what makes most breaches worthy of your awareness. You’ll want to know if your email address is present. With 773 million records in this one, the odds are high. It has plain text passwords. This is the most devastating. Most breaches contain what are referred to as “hashed” passwords — meaning that the passwords are obscured, possibly to the point of being unable to be recovered, if the hash algorithm was well chosen. In this breach, the passwords are there for anyone to see. What’s exceptionally frustrating about this breach, however, is what we don’t know. We don’t know where it came from. We don’t know what service or services were compromised, or what accounts all those email addresses represent. So if you find that your email address is part of this breach (haveibeenpwned will tell you, more on that below) … what then? What concrete action can you take? With respect to this specific breach, the answer is: absolutely nothing. And yet, we can and should do the same thing we do with every breach. Every breach should remind us that account security is important, that it remains our responsibility, and that even when taking the best steps to stay secure, stuff like this can still happen. Pwn? It’s not a typo. It’s a hacker thing. Check out the glossary entry for pwn. Change your password if the breach does involve a specific service that you use. Get and use a password manager to make using long, strong, and unique passwords significantly easier. I happen to use and recommend LastPass, but any of the major equivalents will do. Stop using the same password on more than one site. Seriously, stop it! I can’t underscore enough how important this is. Hackers do try the email address password combinations they find on one service against many others. Given how many people are lazy and re-using passwords, they’re often successful at breaking in. Using a password manager makes using unique passwords significantly easier. Create long, strong passwords. Use 12 characters at a minimum; I currently use 20. I don’t care if you use completely random characters (as I do by default), or long phrases of unrelated words (as I do for a couple of accounts where I often have to remember and type the password). Length is most important, but make them complex while you’re at it. Again, using a password manager makes this easy. Add two-factor authentication to your account if it’s available. Yes, yes, I know it’s not perfect. But it’s still an order of magnitude better than not having it enabled at all. If you’re comfortable doing so, consider running passwords you’re concerned about having been breached through Pwned Passwords. I realize not everyone is OK with giving their password to a third party like that. I trust them, but you don’t have to. It’s simple, really: if you have any concern about a password being compromised, then change it! Change it to something long and strong and unique. That’s the best (and sometimes only) thing you can do: use every breach as a reminder to make sure your personal account security is as good as you can make it. What Should I Do When My Account Is Involved in a Breach? - If your account is ever part of a breach, secure your account to avoid further risk. Do I Need to Worry About the Latest Security Breach? - That’s a composite of several questions that I’ve received relating to a recent theft of something like two million user accounts and passwords. I’ll address this specific incident, but I also want to discuss some things to consider with any large scale account theft. Has a Hacker Really Hacked My Email Account? - A scam claims your email account has been hacked, possibly even including a password you've used. Don't be fooled. 1: Per the initial announcement, there are 772,904,991 email addresses, but 1,160,253,228 unique combinations of email addresses and passwords, in a total of 2,692,818,238 records. This is nothing new. Collection #1, according to Brian Krebs, is actually a database of info that is several years old. I changed all of my important account passwords 2 or 3 years ago because of the last breach so I’m personally not worried. Not only that but I rarely use any form of my real name as a “user name.” I may be wrong but it feels like an extra layer of security to use a fake name as my user name. It is and it isn’t. I think what’s new for most people is that is includes unencrypted passwords. We don’t actually know how old the data is .. could be several years old, could be more recent, but there’s no information on that. I suspect it’s relatively stale data, but given how many people a) use the same password everywhere, and b) never hear about or act on breaches, it’s still an important wake-up call. 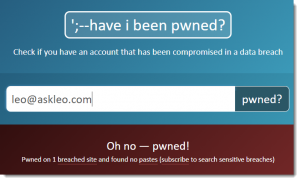 I just learned about the Pwned Passwords this week when I got the email from Have I Been Pwned that my Yahoo email address was involved in a breach. That doesn’t surprise me. It was in the Yahoo breach a few years ago and I changed my password then and secured the account. So I’m at greater odds of being on subsequent lists from having been on the Yahoo breach list. However, I ran a couple of my passwords through there (he doesn’t link your email address and passwords together, so is pretty safe) and found that I have one password that appears on a list. However, it’s not my Yahoo password. Without the links between email addresses and passwords, I don’t know if I have a problem or not. It’s a phrase (rather than a word) with a substitution scheme. It’s possible someone else chose the same phrase and used the same substitution. Oh, well, time for a new password. “I don’t know if I have a problem or not”. You do. Your password is “out there”. Change it, and never use that again. (Even if it wasn’t your account that caused that password to be exposed, it’s still a password that you use(d), and a password that is “known”. Hackers use the databases of known passwords against databases of known accounts. At some point your combination is likely to come up. “At some point your combination is likely to come up.” – Likely? No, not really. If, by some bizarre coincidence, you and I share the same strong password and it’s leaked via a breach of one of my accounts, the risk of the password being used to attack the account on which you used it is exceptionally small. But why take that very small risk? If you use a password manager – and there’s really no good reason not to be using one – it takes seconds to replace the password. Seems like common sense, to me. Another defensive step people can take is use more than one email address. Having a single email address serve as the userid for multiple websites/systems is a bad idea. Multiple email addresses does not mean multiple mailboxes. There are two approaches, that I know of. 1) Register your own domain and create an unlimited number of forwarded email addresses. For example, user1@mydomain.com and user2@mydomain.com and user3@mydomain.com can all be automatically forwarded to your current email address. Many domain registrars offer this service. 2) Pay for email with a service that allows for aliases. An alias, as the name implies, is just a second or 3rd or 4th or 5th name for one email inbox. This is probably a bit more reliable as there is no forwarding involved. On email provider that allows multiple aliases is Fastmail, no doubt there are others. I use Microsoft’s free outlook.com email and that allows aliases. I have been doing that multiple email address thing for 4 years. I own my domain and I currently have 30+ email addresses. My theory when I started this was that when I start getting spam I will know where the hacker found my email address. But it doesn’t really work. Turns out I would need over 600 (yes, six hundred) different email addresses just to give each subscription a unique email address, and then there’s all my email correspondents – Thunderbird doesn’t tell me how many email addresses are in my Address Book but I bet I’ve got as many as everyone else – a lot. It take several minutes to create a new email address and set Thunderbird up to manage it. No thanks. Only 1 or 2 spams get through each day so I have stopped creating new email addresses except for banking and other financial stuff. One thing I am still doing, I don’t use the same identity on more than one site. Here I am “Boatman”. If you see that identity/username anywhere else it isn’t me. I have one email address for all questionable signups. It gets more spam than my real accounts but that’s what it’s for. Surprisingly, I don’t get that much spam, even on that account. I believe the reason is that Yahoo has a great spam filter. So, you give your email or password to some website to “check” if it has been “breached”? Do you also want to know a site where you can check your SSN? You can also hand over all your personal and financial information to some site to check if you’ve been “breached”. And don’t forget to tell Facebook that you’ll be on vacation for two weeks. About this particular Collection #1: by most indications this was not a breach (such as hacking into the Equifax database) – this was a collection of data from 2000 previously stolen databases. Yes, a collection of several years of previously stolen databases will be large, and yes, the data would have been scrubbed so that there are plain text passwords. Leo, someday you should write an article about the distinction between a stolen database and a breached individual. That’s why you don’t check your account on some random website. I trust Leo’s recommendation and I’ve looked into it myself. I truly believe this website is about protecting you, not stealing your info. Other websites I wouldn’t trust. Is it true that with using LastPass that you don’t know what your passwords are? If true it seems nonsensical that you do not know what your passwords are. I cannot tell you my banking password, for example. I can look it up in LastPass, if I need to, but since it enters it into the website for me I have no need. This is a sit I’ve never heard of before so does this imply that ALL of my passwords are at risk . It means only that the one email address was breached. It’s typically unrelated to getting spam. Checked at the website Leo give and this is the result. Change the passwords for those four accounts, and stop using those old passwords anywhere ever again. Leo, it might just be me being a little dense, but what sites? I was apparently breached on 1 site, again on the ‘record onliner spambot dump’, but what site does this relate to? I can’t see what site I need to change my password on. I really don’t fancy changing them all! This particular dump doesn’t tell you. What you can do is check your high-value account passwords using the password checking function and then changing any and all accounts that show up there. I give you credit for correctly quoting Shakespeare and saying “Once more *unto* the breach.” Most people, including several English teachers I know, think it says “*into* the breach.” Good for you. Read the article you are commenting on and follow the instructions. Thank you Mark but I did read the article and I did follow the instructions regarding changing password etc. But I can’t find what we need to do to remove Onliner Spambot. Or am I missing something blindingly obvious? Your email address being listed with Onliner Spambot doesn’t necessarily mean you’ve been infected. It just means they have your email address and probably have sent you spam with malware attached. If you haven’t opened that attachment, you shouldn’t be infected. If you opened the attachment, you would follow the normal procedures for removing malware. Thanks for your help leading us through what is now the minefield of internet security. Here, I can enter my credit card numbers, passport numbers, email addresses…. everything. Sounds comforting, but if this place is ever breached I could not possibly be more in a world of pain. Am I wrong? Should I take this offer up? Many thanks for your thoughts here. I honestly don’t know about “IdentityWorks”. I don’t currently have a monitoring service in place, though I’ve been offered. My approach has been to a) lock my credit reports at the three major credit bureaus, and b) sign up for CreditKarma so I can proactively watch myself. The problem is that, yes, for monitoring to work you do need to give some agency the sensitive information you’re concerned about. I don’t know that there’s a simple answer. Monitoring is not a cure, solution or prevention. At best, all they will be able to tell you is that your data may be in some database where it shouldn’t be, or tell you, after the fact, that you have been breached. You should check your accounts on a regular basis and not wait for someone else to inform you that your bank account balance went to zero. You should put alerts on your accounts (through your own financial companies). You should also take time to research what is meant by “scanning the dark web”. Information that can be scanned is already public information (such as data dumbs of already compromised databases). Scans cannot get into proprietary databases (especially on the dark web). Besides, you don’t have to go very dark to dig up information on yourself – just pay a few dollars for a report on one of those personal information search sites. https://www.experianidworks.com/terms/. Naturally, you would expect that every word in there is designed to protect Experian, but this one caught my eye “… make no warranty that (i) the services are accurate, timely, secure, uninterrupted or error-free; and (ii) any results that may be obtained from the use of the services will be reliable.” Cool. Rather than relying on an emailed invitation, try a Google search for Starward Hotels. I don’t have to search. I know them as a chain of hotels. Now ask yourself if a hotel chain would be interested in protecting your credit card, passport number, email address, etc. If it was me, I would be running in the opposite direction. It’s helpful. Tnx. I use MS password gen app to create passwords.